Anyone think that I have a snowballs chance of getting anything from this? 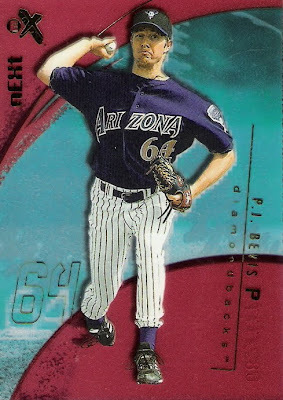 I came accross this unused redemption card today while going through a 5000 count box of mine that I haven't looked at in years. 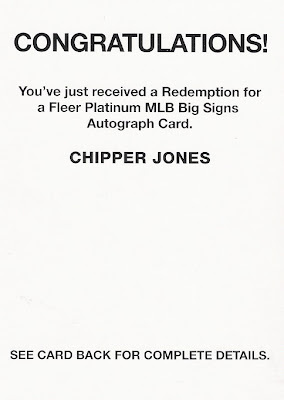 It's from 2004 Fleer Platinum and is for a Fleer Platinum MLB Big Signs Autographed Card of Chipper Jones. 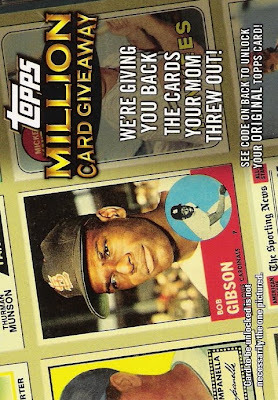 On the back it states, "This Redemption Card offer does not have an expiration date." 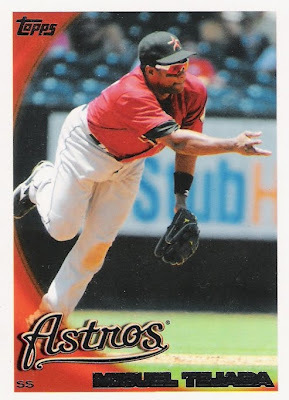 However, Fleer no longer exists. 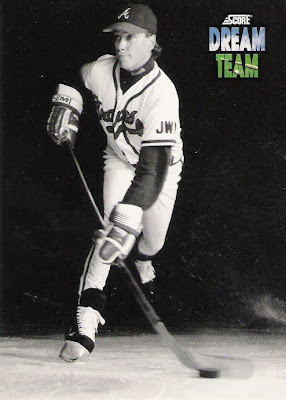 I emailed Upper Deck just to see what they will say. I'm guessing I will either not get a response or that they will say that they are not redeming any Fleer redemptions, but I thought I would give it a shot. Not sure why I never redeemed it. 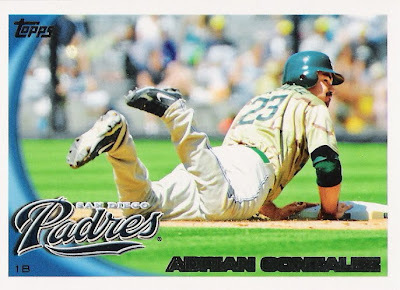 I would love to have a Chipper auto in my collection. I will follow up if I hear anything back from Upper Deck. 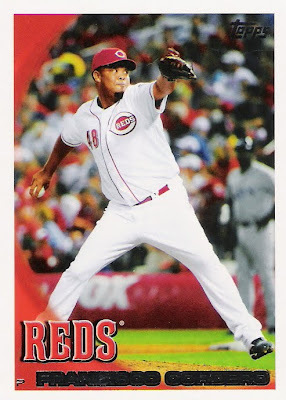 Francisco Rodriguez - I'll try to get this signed during Spring Training. 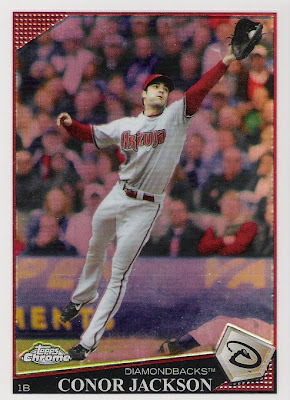 Andrew Bailey - I've always like cards that showcase an award winner. 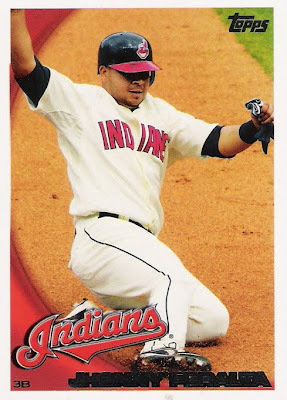 Jhonny Peralta - I'll try to get this signed during Spring Training. Adrian Gonzalez - How often do they wear the camo jersey? Because it seems like I have tons of cards with them wearing it. 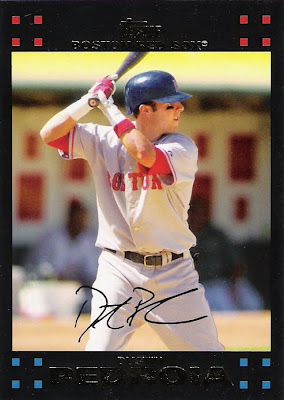 The Cards Your Mom Threw Out - 2007 Topps Dustin Pedroia - I like the set concept, but really they are going to include a card from 2007? Million Card Giveaway - I'm excited about this! 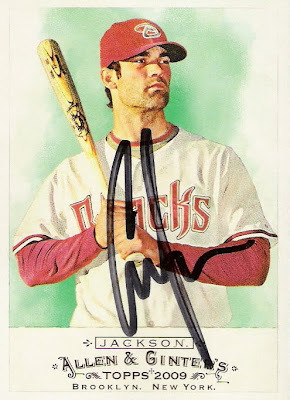 I sent this 2009 Allen & Ginter card to Conor Jackson on 8/4/09 and recieved it back, signed, on 1/28/10. It took almost 6 months, but it was worth the wait. 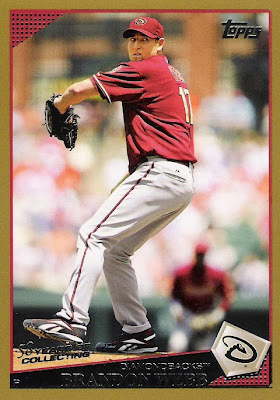 I'm excited that the D-Backs re-signed Conor and wish him the best in 2010! Thanks Conor! Todays mail contained one package, an eBay purchase. 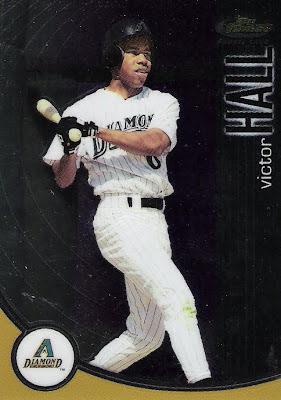 I picked up another bat card of a member of the 500 Home Run Club. 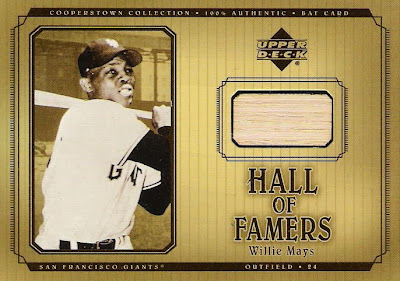 Willie Mays ended his career with 660 home runs! He is currently #4 on the all-time list. 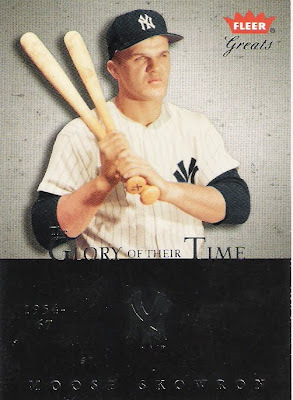 I now have bat cards of 10 members of the 500 home run club, only 14 more to go! 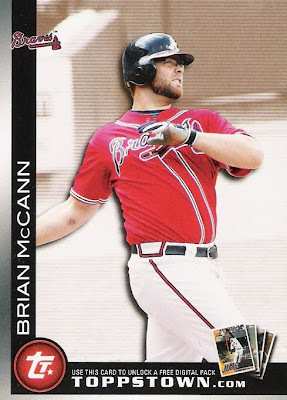 Brian of the blog Play at the Plate contacted me about one of my Trade Bait posts. 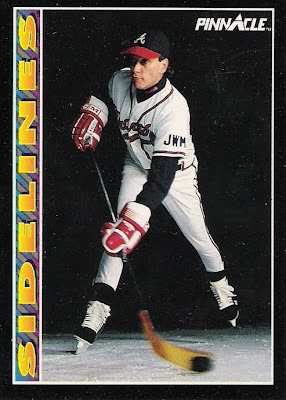 He was the first to claim the Ted Williams card, before everyone else and then also a couple of Rangers cards. Here is what he sent me as trade. 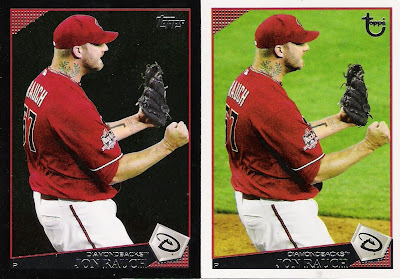 He knocked off a couple of D-Backs players that I didn't have a card of plus sent me everything shown below. All but 2 cards that he sent were numbered, game-used or auto! I wish I was as luckey as you were to pull so many cool D-Back cards! Thanks Brian you should be getting your package soon! 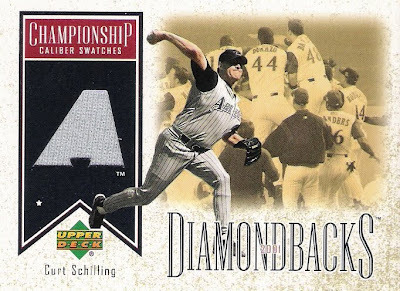 2002 Upper Deck Curt Schilling Championship Caliber Swatches Jersey - On the back it states that the piece of jersey was worn in a Phillies game. 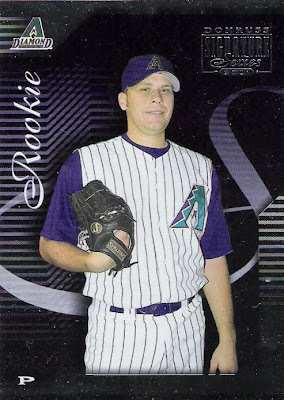 The D_Backs have grey jerseys. Why not just say it was worn in an MLB game and leave it at that. 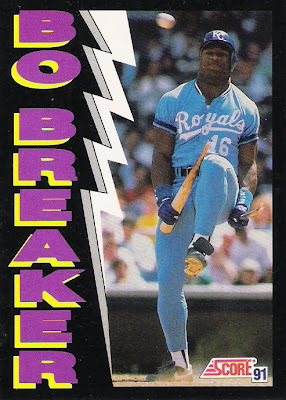 I'm going to start a section in my collection for cards like these. 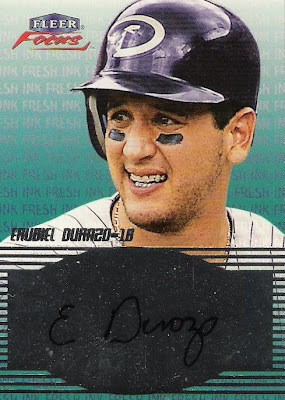 2001 Fleer Focus Erubiel Durazo Fresh Ink Auto - Awesome card! 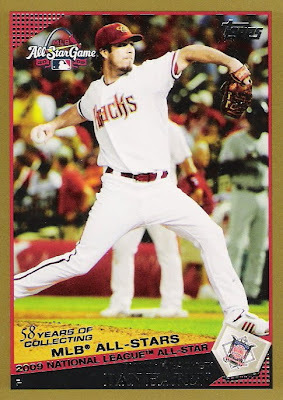 I really liked Durazo and am super excited to have this card! 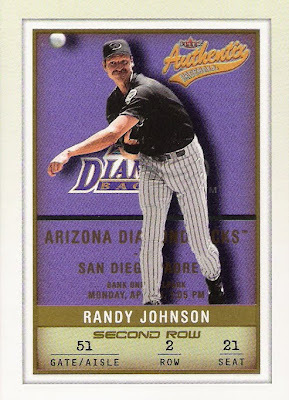 And you thought the first baseball cards to feature memorabilia were the 1997 Upper Deck Game Jersey cards. 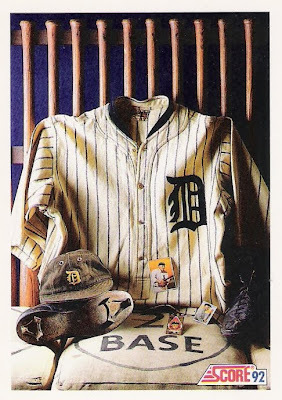 1992 Score featured a 5 card subset that showcased some pretty sweet memorabilia from some of baseball's all-time greats. 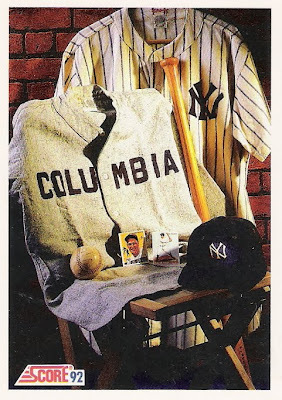 Each card features memorbilia courtesy of the Barry Halper Collection. Imagine all that memorabilia owned by the same person. 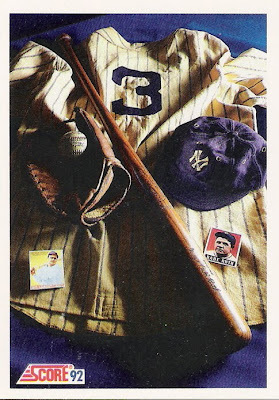 I have no idea what the combined value of all the memorabilia would be that is featured on all 5 cards, but I would gues that it is close to $1 million. What's better than TTM? Why, an in person autograph of course. 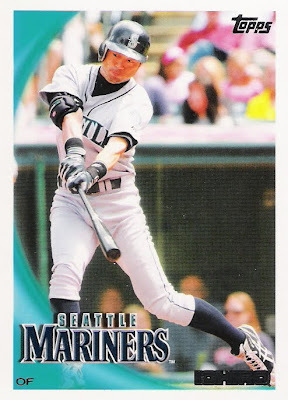 Now, I know he's not a baseball player, but it's a baseball card, right? 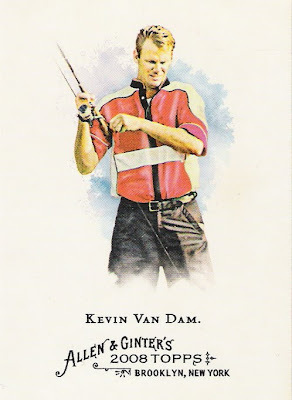 So when I saw in this past Sundays Arizona Republic newspaper that Kevin Van Dam would be at the Bass Pro Shops in Mesa signing autographs today, I remembered that I had pulled this card out of a box of 2008 Allen & Ginter last year. I couldn't resist. So I packed up the kids, picked up my Dad and we headed over to the Bass Pro Shops store. He was supposed to be signing between 3:30 and 4:30 pm, but we got there about 3 o'clock and he was already signing. I waited in line for maybe 5 minutes before having him sign my card. 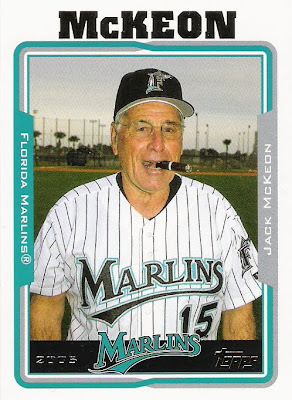 Honestly I had never even heard of him before getting this card, but his resume is impressive. 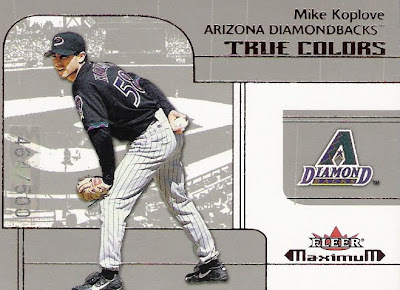 From the back of the card we learn that Kevin earned the B.A.S.S. Angler of the Year Award three times during the 90's. 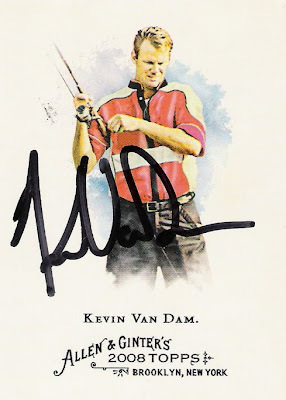 He won the Bassmaster Classic in 2001 and 2005 and has also been ESPN's Outdoor Sportsman of the Year. I may not know anything about fishing, but I know that he is talented at what he does. He was also very nice. Thanks for the autograph Kevin! This almost made one of my "Cards so cool...I don't have to write anything!" 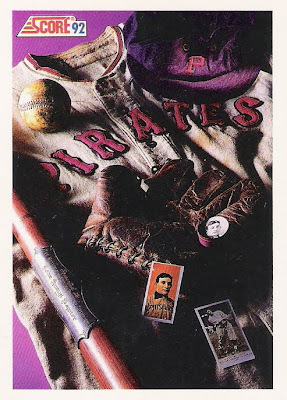 posts, but I wanted to write about it, so I came up with a different title, "What a baseball card should look like!" 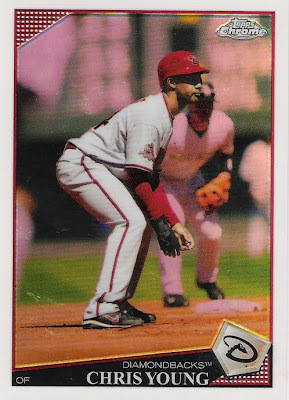 I've mentioned before that I like game-used cards that are from a specifc event or game. 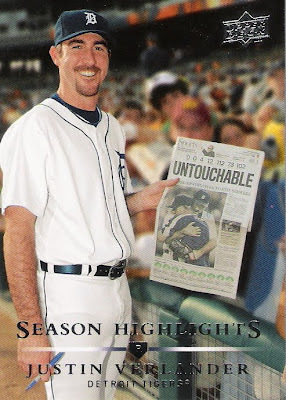 In 1997 Upper Deck used that same concept and told you when the picture on the card was taken and what was happening. 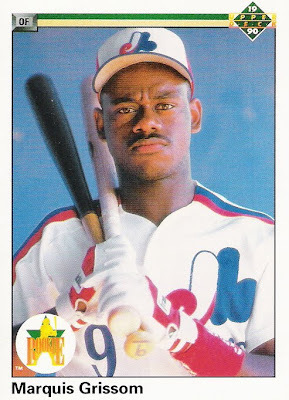 Check out this 1997 Upper Deck Bernard Gilkey card. 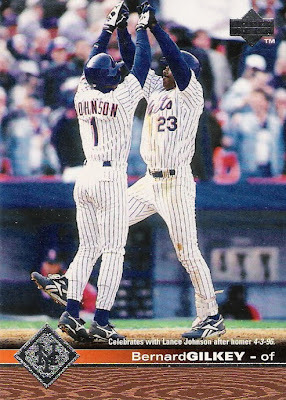 The bottom of the photo reads "Celebrating with Lance Johnson after homer 4-3-96". I think that it's a great photo and now I know exactly when it's from and what happened. 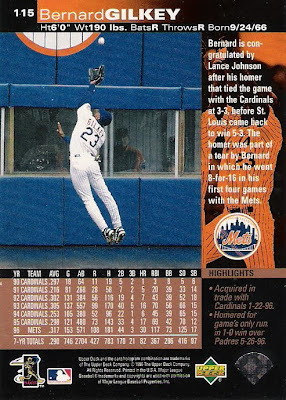 The back of the card features another awesome photo of Gilkey in the outfield trying to make what would be an amazing catch. 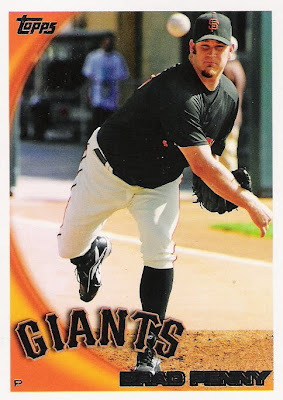 It's also loaded with stats and facts about Gilkey. 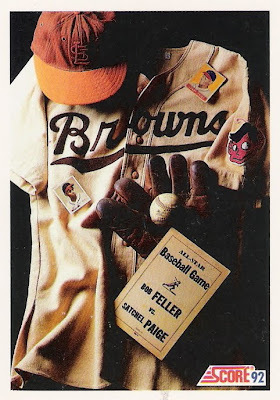 In my opinion, this is what a baseball card should look like! 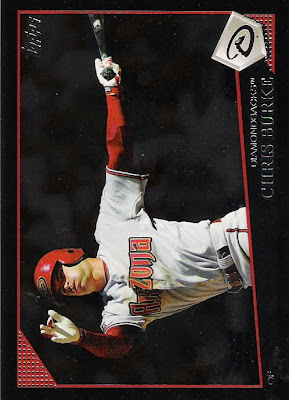 Chris is of the blog Budget Baseball Cardboarding contacted me about a Gordon Beckham Bowman Chrome Rookie Card that I featured on my blog. We arranged a trade I got his package on Monday. Here are the highlights. Thanks Chris! 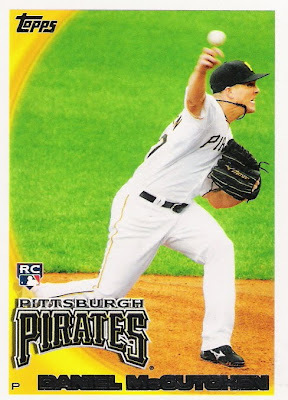 2009 Topps Gold BRANDON WEBB #'d 1825/2009 - This one counts towards my Personal Collection and my Brandon Webb Collection! 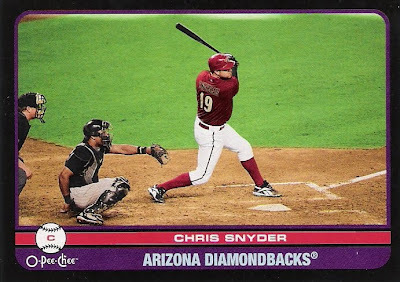 2009 UD O-Pee-Chee Black Border CHRIS SNYDER - I love these black parallels. I would like to get the D-Backs team set. 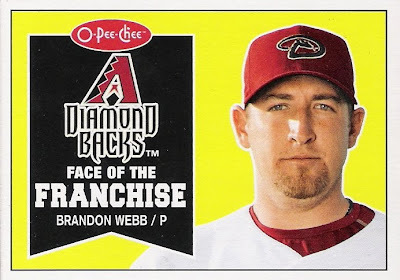 2009 UD O-Pee-Chee BRANDON WEBB Face of the Franchise - Another new Webb to add to my collection! I'd already completed a trade with Angelsfan of Omega Cardboard, but this time Giantsfan and I recently completed a trade. He had pulled a Conor Jackson XFRACTOR and posted it on his blog wondering if I would be interested. Of course I was. So we arranged a D-Backs/Giants trade. I got his package on Monday. Here are a few of the highlights. Thanks Giantsfan! 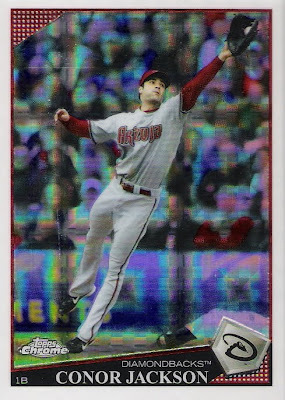 2009 Topps Chrome CONOR JACKSON XFRACTOR - Sweet! 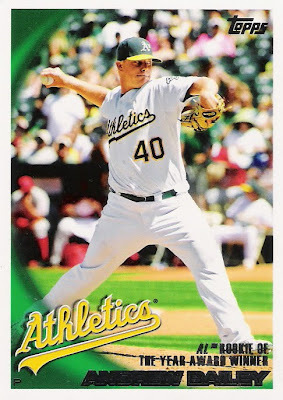 2009 Topps Chrome CHRIS YOUNG Refractor - Nice! 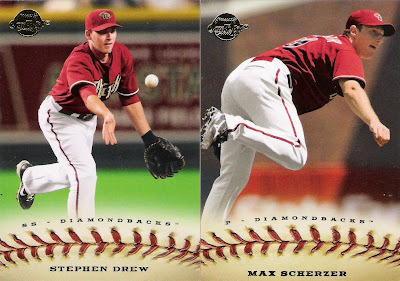 2009 Sweet Spot - Stephen Drew and Max Scherzer - Always nice to recieve Sweet Spot D-Backs in a trade, because I won't be buying any packs anytime soon. 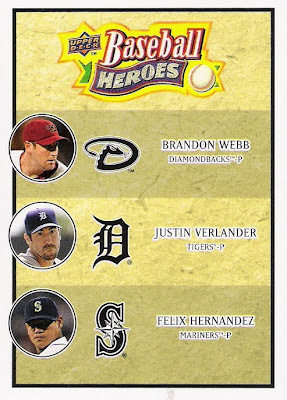 2008 UD Heroes WEBB/VERLANDER/HERNANDEZ - A new Brandon Webb card to add to my collection! I came accross these two cards recently while going through my collection. I pulled them out to addd to my Multiple Bats collection. 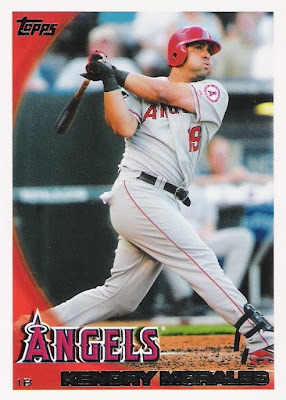 I think I have decided that to be included, the cards must feature a player holding more than one bat and not just feature more than one bat on the card. This limits the cards in this collection even further, but it makes it all the more fun when I come accross a card that fits the criteria. 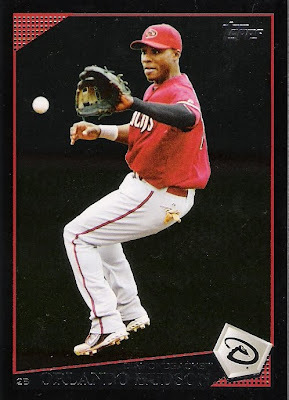 My 2010 goal was to have 50 cards in my multiple bat collection. With the addition of these 2, I am now up to 20 cards.